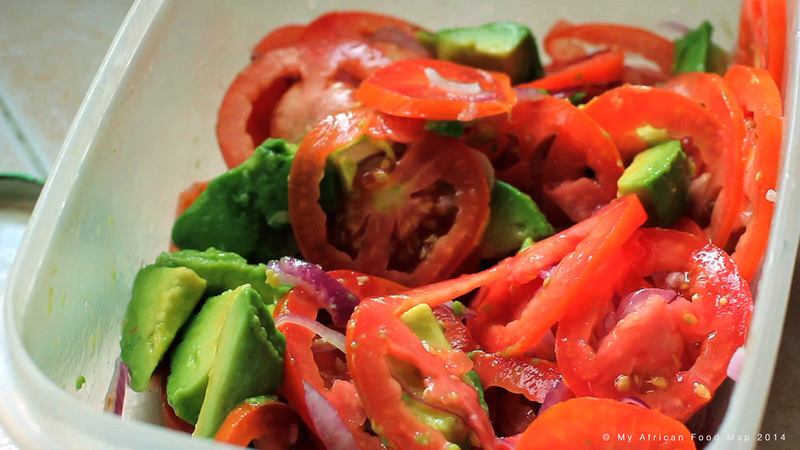 Slice the tomatoes in relatively thick pieces and place in a serving bowl. Slice the onion and place in a separate bowl. Rinse and add the salt before massaging it into the rings. Add the onion to the tomatoes. Cut your avocado into small cubes and add to the mix. Miss Diana: “It’s my own way of making kachumbari but I’ve also seen other people do that. And the reason why we have to clean and massage the onions: it’s because the onions are very strong, so we tend to neutralise the onions by cleaning them and going through all that process. Student 2: Ya, it has to. It’s the one.